Watch this clip from MSNBC. 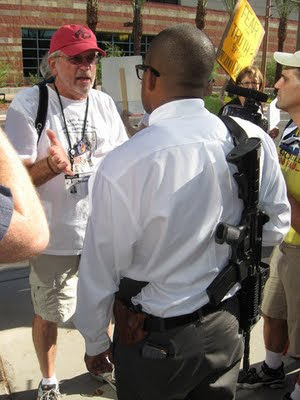 It shows a man carrying an AR-15 and handgun while protesting against the Democratic Health Care plans in Arizona. (via Hot Air). I am NOT saying that President Obama faces no race-related threats, but there is huge overpromotion of the idea that current opposition to the health care proposals is primarily race-based. This is like saying that Bush was hated by the left for his racial or socioeconomic background (though the latter may have played a role with some). President Obama and the liberal democrats in Congress have violated some principles that resonate with most Americans. That is the true source of these protests, legitimate loonies notwithstanding. "President --insert last name-- and the --insert political adjective-- --insert political party-- in Congress have violated some principles that resonate with most Americans. That is the true source of these --insert public action--, legitimate loonies notwithstanding." I am not criticizing the blog post, but I feel like the above statement can be made at any time in history. True enough. But I think the current issue has created a much broader base of dissent than almost anything in the last several decades.